Unlike the American automotive industry, Toyota encouraged employees to be a part of the production process. The company introduced quality circles, which was a group of workers who meet to discuss workplace improvement. Quality circle members make presentations to management with regarding the quality of production. Toyota developed a set of procedures that reduced the time required for setup and changeovers. 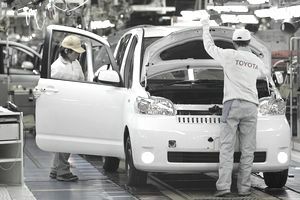 Unlike Ford’s production, Toyota developed manufacturing in smaller batches and this required a set of processes that reduced setup and changeover times. The resulting procedure was Single Minute Exchange of Die (SMED). There are seven steps used in the SMED method for the changeover, including streamlining the external and internal activities. The developments made by Toyota were adopted by other Japanese manufacturers but none were as successful. In the 1980s, American companies began to adopt some of the processes developed by Toyota and gave these names such as Continuous Flow Manufacturing (CFM), World Class Manufacturing (WCM), and Stockless Production. The benefits in material handling when lean manufacturing procedures are deployed include fewer moves of material, shorter travel distances in the warehouse and simpler picking routes in the warehouse. These also contribute to savings in inventory and improvements in quality. By using smaller lots, the inbound and outbound queues are smaller. This reduces the inventory required to be in the queue and therefore the inventory level overall. Smaller lots mean that any quality issues that arise can be dealt with at the time of manufacture. In manufacturing processes with larger lot sizes, quality issues may not be identified until late into the process and can be costly to correct, both in time and resources. Improvements in material handling, inventory, and quality all lead to a more successful manufacturing operation. If items are produced on time and delivered to a customer by the delivery due date, customer satisfaction will increase. The same is true if the items sent to the customer are of a higher quality standard. This will reduce the incidence of repairs, returns, and customer complaints. Ultimately, your lean manufacturing processes need to support your company in delivering its customers with what those customers want, when those customers want it - and accomplish that by reducing costs. That is not only the definition of optimized supply chain but the principle at the core of lean manufacturing. Whether you are investigating lean manufacturing as a support tool in order to cut waste from your operational processes - or you are looking at Six Sigma for the same reason, you need a program that isn't just a one-off project, but a change in the way of life at your company. If you're hoping that lean manufacturing will become a panacea that will fix all your company's ills - then you'll need to understand that lean manufacturing isn't just about fixing one aspect of your shop floor. A process-oriented change means an evolutionary shift in the way your business operates. Understanding that is your first step to a successful shift toward lean. This article about the origins and principles of Lean Manufacturing has been updated by Gary Marion, Logistics and Supply Chain expert.